When your storage needs to go beyond heavy-duty, choose this Extra Heavy-Duty Storage Cabinet from Sandusky Lee. 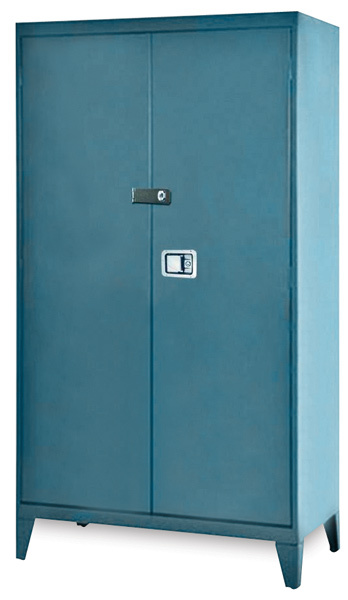 Designed to offer a superior level of strength and security, it features all-welded, 16 gauge steel construction and supports up to 1,000 pounds evenly dispersed on four heavy-gauge shelves that adjust on 2" (5.1 cm) centers. Doors feature full piano hinges and are secured by a paddle-style handle with a three-point key lock system. An additional hasp is included for optional padlock use. Choose from four sizes, all of which are equipped with strong steel legs that raise the cabinet 7" (18 cm) off the floor.